I received a Midori Traveler’s Notebook for Christmas this year and I am already “moved in” (cool Midori speak). I am using it as my on-the-go art journal. The cover is so yummy to look at and hold. I also love the simplicity and flexibility of the system. I can make countless inserts without having to worry too much about binding anything. It is absolutely perfect for this “There Are No Rules!” girl in constant need of change. I was so excited about it that I made my own inserts before the cover even showed up on my doorstep. I am loving the portability of it. I am already journaling much more than usual and I am continuing to experiment with inserts, painting and gel printing pages, etc. 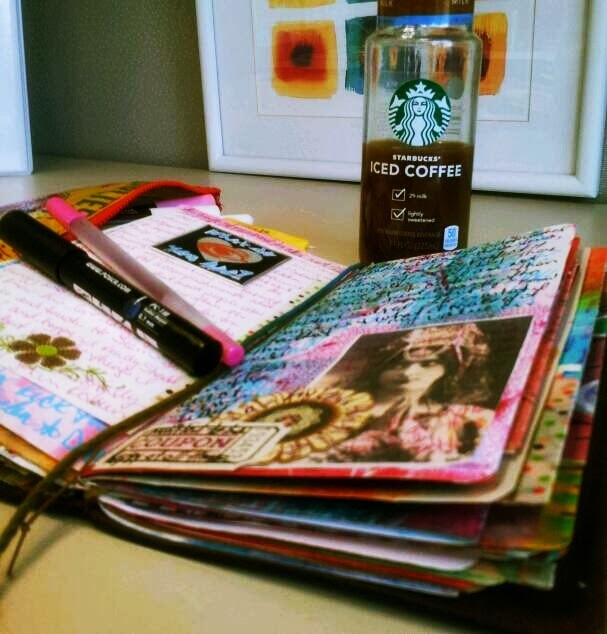 Monday morning coffee and some art journaling in my Midori Traveler’s Notebook…these pages include Uni Posca paint pens, Gelly Roll pens, washi tape, rub ons, and collage over prints made on my Gelli Arts Gel Printing Plate. I am back at work today after a glorious week spent as a hermit at home (as in a do it yourself stay-cation art retreat). I barely ventured outside last week, most of the time I stayed in my PJs and was covered in paint. I had a fantastic time making art in my studio and on the couch. I made a couple of videos, caught up on some projects and posting photos online, and I even squeaked out a couple of last minute artsy gifts and did a little art supply therapy shopping. Oh man It was tough to leave home this morning. 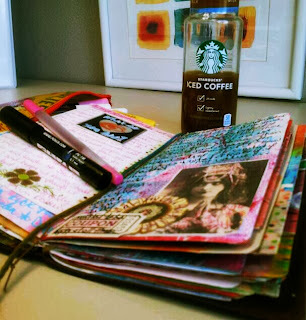 I eased in to my day by art journaling before I got started at work. Something I hope to continue. What did you create in your art journal this week? Love the journal! I have only recently heard of thesse Midori Notebooks... might have to look into getting one! It's narrow, but I am loving how portable it is. If you are needing something a little wider, there are some Etsy.com type options that are a little more customizable. Let me know what you end up doing. Would love to see.